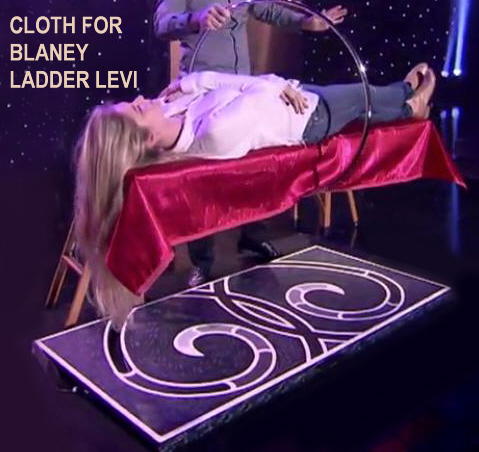 custom cloth for the Blaney Ladder Levitation made by S&K Theatrical Draperies in Los Angeles. When we bought our Ladder Levitation, the red velvet cloth with yellow fringe that it came with didn't fit our style, so we had a custom cloth made by a Los Angeles drapery company, out of a red semi-shine material with vertical texture. 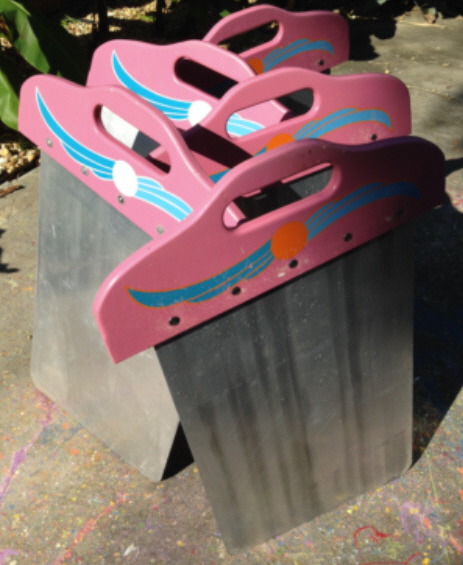 It has a very contemporary and classy look and it has a custom rubber pad sewn in to the underside, so that once it is placed on the board, it can't move an inch when the volunteer is getting onto and off of the prop. It is perfectly sized to fit the Blaney Ladder Levitation board. 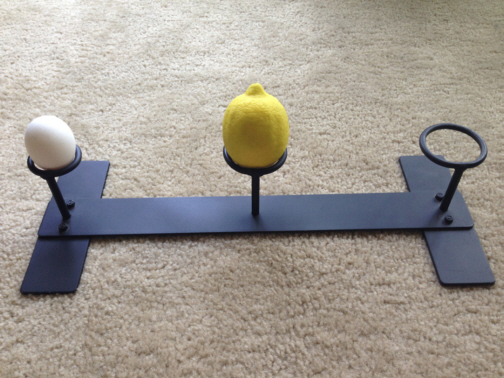 One of a kind, custom stand for the Orange, Lemon, Egg & Canary fruit, built by Wellington. Also included is an artificial lemon and egg for use in the effect. This would sit on any table and keep the fruit elevated above the table top, putting it in focus and keeping it extremely visible through the routine. This is built extremely well and is perfectly sized. This is a very unique new idea for those of you that perform Bowing Ball from Briefcase or Bowl-A-Rama (Bowling ball from art pad) With this prop you can have the briefcase or art pad on top of the chest before you perform the trick. 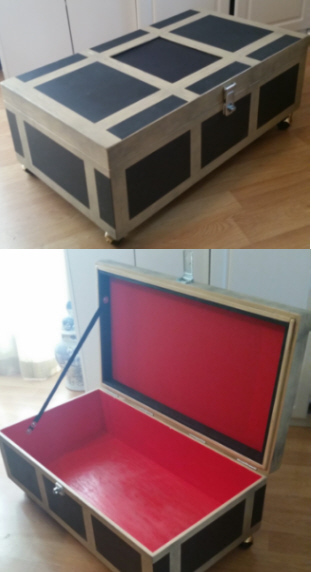 The chest has black spandex on top and red spandex on inside of lid. It's super deceptive. You can also put other show props inside of chest. You can also put bowling ball, art pad or bowling ball inside after the trick. No more award moments of walking off stage to get briefcase or art pad because this is right there in plain view! This is a heavy duty box built with 1/2 birch ply and a great paint job. It's brand new and worth twice the asking price. 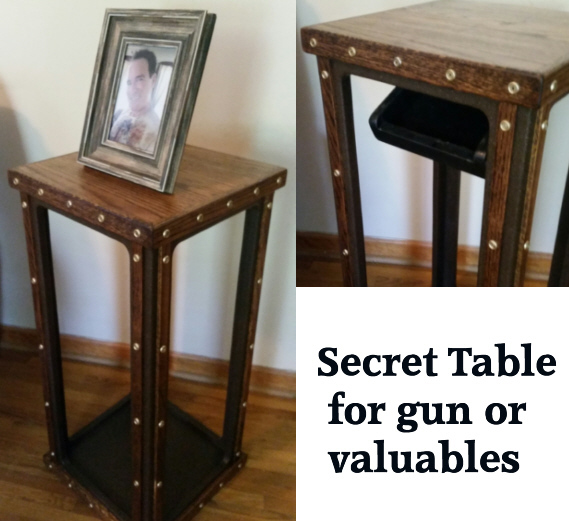 It's not a stage trick but a secret table that you could put valuables inside - use it for home invasion and put your hand gun inside. This is a table that designed and built in case of home invasion. It can hold valuables or a gun. There is a secret compartment in the bottom. It is held in place with velcro and 2 sliding bolt locks. 2 metal chains keep the compartment at at angle when it is pulled down. The table is 15 x 15 inches and stands 32 inches tall. It weighs about 22 pounds. The main frame is built with top quality birch 3/4 plywood and then painted with a brown granite texture paint. The top and all the trim is high quality red oak. There are 60 gold finishing washers and screws to add decore. This is a beautiful piece of furniture for any upscale home and is VERY deceptive. It is so thin that no one would ever suspect that it is a hiding place for something. The secret compartment is 9 and a half xoxo and 3/4. Most guns are under 1 and a half inches wide. It is also a great piece to show off to your magician friends when they pay you a visit! These are one of a kind and I only have 2 for sale. I bought it 20 years ago and never used it once. Just been in a box in my closet all these years. I looked and couldn't find any name or brand on it. A foldable form of a person and includes a beautiful silver and black metalic sheet as pictured all in perfect condition, never used. Super Smooth 18" x 4 Feet with very strong adhesive back - dead black cover for load chambers etc. - In a square circle without any grill work in the front (Can be an open design) You can't see the load chamber from only 3 feet away. Just Cut to size - peel and apply. Not the stuff you find in a craft or fabric store. Great for Black Art Projects. Inquire for larger pieces 4 feet wide by ? THIS IS IT! 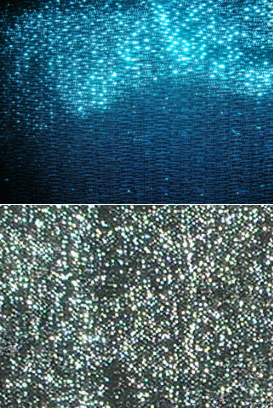 - Coveted by magicians as the GO TO fabric for all who perform any dancing hanky routine or effects where hiding line or thread is a must. TWO (2) full curtains of 16 foot wide x 16 foot tall. Weighted with chain at the bottom and professionally prepped to hang from the top with grommets through burlap at the top to hang a the top with chains. Amazingly reflective and beautiful rich and vibrant blue. These pictures don't do it justice. Must be seen to be believed. Accessory for building a levitation. not visible to the audience, design painted by sign painter. Great way to end any show, lots of color and fills the stage. 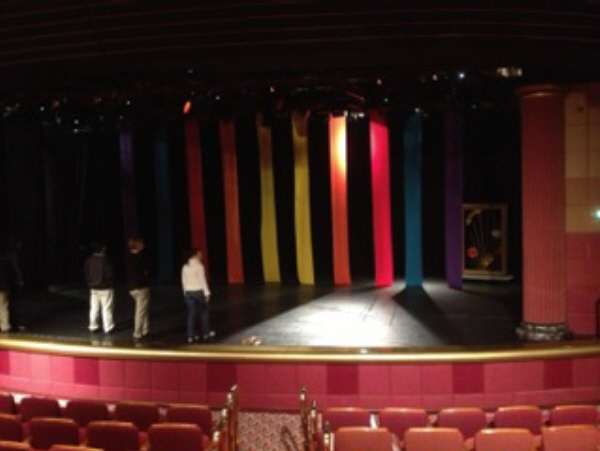 An empty stage is quickly filled with one pull of a cord as 10 colorful banners unroll from the ceiling down. Banners are 22 feet long. Packs small but plays big! Here is what Sean Bogunia has to say about Nu-lash. (Dancing Hanks, Floating balls, etc). 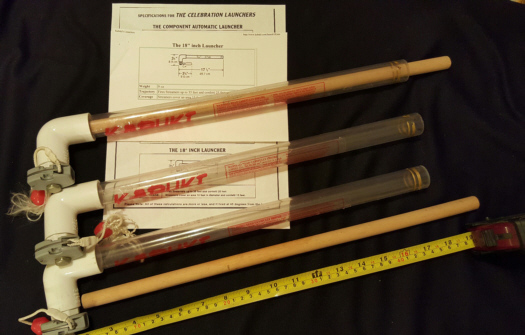 One picture is what it looks like when it is setup and ready to go. There is no top above the performing area of stage. There is no lighting or sound equipment that comes along with it either. The living area is not finished. 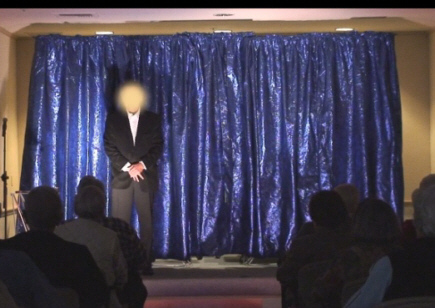 After I bought the stage a few years ago I added to the stage area to make it bigger and put all new wood on the stage area. 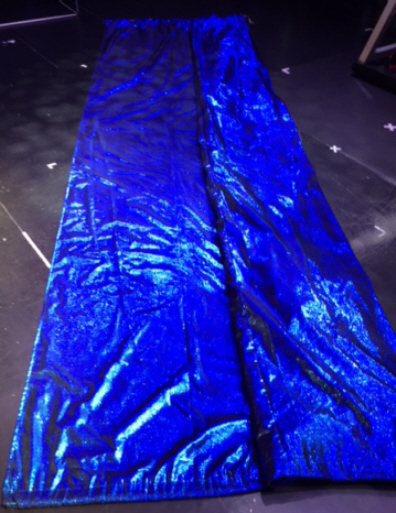 I also painted the showtime theater look on to the stage and bought all new blue skirting to put along the edge of the entire stage. I was going to remodel the living area but never got around to it. Stage is very well built and is great for any outdoor events. Living room - 8ft long - - 7ft wide - 8ft tall - Trailer width - 16ft long - 7ft tall - 1ft tall Storage compartment under the stage. Side and Back - Back of Trailer stage 8ft long - 4ft tall - 7ft wide - Could store props inside stage. Electrical: standard rv plug. Weight of Trailer somewhere around 5000 - 7000 lbs? - Staging area is at the back of the trailer with a door that leads into the living area. Inside of trailer living or storage is 9ft from front to back and 7ft side to side. Side door is 34in wide and 80in tall. There are two small bunk beds and one small storage room inside of trailer. Needs to be fixed up a little. I did not fix this yet because I was waiting to see if I was going to keep the trailer.